Description: Their hair is course gray to gray-brown, interspersed with long guard hairs. 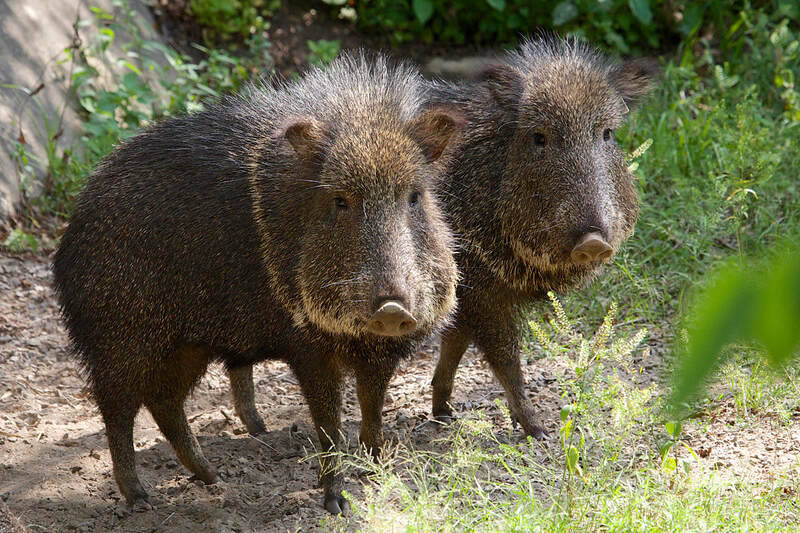 Chacoan peccaries differ from the other peccary species by having longer ears, snout and tail. There is a whitish collar across the shoulders and under the chin, which is thinner and less distinct than that in the collared peccary. The head is extremely large, and the nose tapers to a snout disk made of cartilage. Habitat: Semi-arid thorn forests, savannah plains and seasonal marshes where temperatures are high and rainfall is low. This area has small trees, dense shrubs and various plants covering the ground, including cactus. Range: Chacoan peccaries live in one of the hottest and driest regions of South America, the Alto Chaco in Paraguay. Diet: Chacoans feed on various species of cacti, fruit, roots herbs and occasionally invertebrates. They use their tough leathery snouts to roll the cacti on the ground, rubbing the spines off. They also pull the spines off with their teeth and spit them out. The kidneys of the Chacoan are specialized to break down acids from the cacti. This species of peccary seeks out salt licks formed from ant mounds to gain essential minerals. Life Span: 9 years or more. Family Life: Peccaries live in small groups of two to ten individuals, with most groups consisting of four to five adults and accompanying juveniles. These groups typically stay together even when they are being attacked. If running away proves impossible, as a defensive strategy, members of a herd may line up in a defense wall; this makes the herds easy targets for hunters. 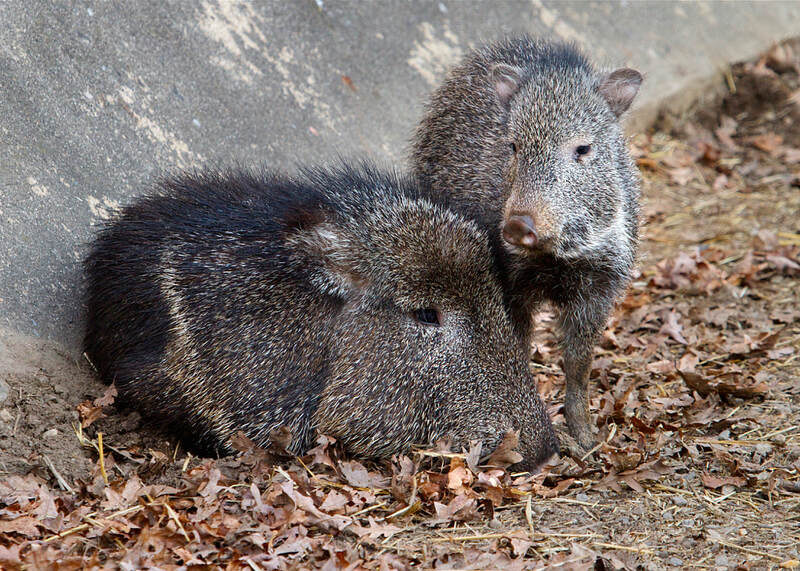 The breeding season for Chacoan peccaries is typically September through January but litters have been found almost year round. Their litter size ranges from one to four young, with about a year between births. Status: Endangered. The populations are decreasing due to habitat clearance for cattle ranching, disturbance from development, isolation from other herds, commercial trade of their meat, and disease. Chacoan peccaries are a Species Survival Plan animal. Chacoan peccaries are the largest of the three peccary species. The other, more common species of Peccaries are the Collared Peccary (sometimes called the Javelina) and the White-lipped Peccary. They are between 1.5 and 2.5 feet at the shoulder and weigh between 66-88 pounds. They communicate by various sounds such as grunting and teeth chattering. Peccaries are diurnal (active during the day) and tend to be most active in the early morning hours, then finding a mud wallow or dusty area to cool off as the day heats up. When frightened, Chacoan peccaries flee, raising the long hairs on the backs and spraying secretions from their dorsal glands. Scientists think that this is to keep the group together through dense brush by smelling the odor. These secretions are also rubbed against group members and are used as territorial markers. They are known as “spirit masters of the forest” by native people. Come see our Chacoan peccary exhibit in the new Pampas Plains area.